Xeriscaping (zer-i-skaping) is landscaping with water conservation as a major objective. The need for landscaping to conserve water gained attention in the western states after the drought of 1977 and the recognition that nearly 50 percent of the water used by the average household is for turfgrass and landscape plantings. Unfortunately, many homeowners have cut back on turfgrass areas by substituting gravel and plastic as an answer to water conservation. This practice is not only self-defeating as far as water conservation is concerned, it also produces damaging effects to trees and shrubs. This initiatives teaches residents the benefits of xeriscaping and explains how they can successfully xeriscape. A majority of Muncie lawns consist of too much turfgrass or sod. These lawns lack native plants failing to establish deep root systems and natural habitat. This is important for three main reasons. Without deep root systems water is not able to slowly percolate through the soil to recharge groundwater. Instead this water quickly turns to surface runoff, collecting pollution along the way, before draining directly into the White River. Additionally sod requires significantly more water to stay healthy and green compared to native species, requiring more maintenance and money. Finally, sod does not provide a healthy habitat for beneficial insects such as bees, who provide pollination. Without pollinators, the food chain will loose its balance and significantly decrease food producing capacities. Xeriscaping can be accomplished in 7 steps: planning, considering slope of property, reduce irrigated turf, soil preparation, irrigation, mulching, and carefully selecting plants. Whether you want to redesign an old landscape or start fresh with a new one, a plan is a must. The plan does not have to be elaborate but should consider the exposures on the site. As a rule, south and west exposures result in the greatest water losses, especially areas near buildings or paved surfaces. You can save water in these locations simply by changing to plants adapted to reduced water use. However, don’t be too quick to rip out the sod and substitute plastic and gravel. Extensive use of rock on south and west exposures can raise temperatures near the house and result in wasteful water runoff. Avoid narrow strips of turf, hard to maintain corners, and isolated islands of grass that need special attention. Not only is maintenance more costly, but watering becomes difficult, often wasteful. If your yard is already landscaped, evaluate where you could eliminate unneeded turfgrass areas. Turf can be reduced to areas near the house or that get high use. In outlying areas, use more drought-resistant grasses or even meadow mixes containing wildflowers, particularly if your property is large. Proper soil preparation is the key to successful water conservation. If the soil is very sandy, water and valuable nutrients will be lost due to leaching below the root zone. If your soil is heavy clay, you will lose water through runoff. A good soil, one that supports healthy plant life and conserves moisture, has a balance of rather coarse soil clusters (aggregates), sand and pore spaces. The ideal soil has as much as 50 percent by volume pore space, with the soil itself consisting of a good balance of sand, silt and clay. If soil improvement is a priority, use organic mulches. Wood chips and compost are most appropriate. As these materials break down, they become an organic amendment to the soil. Earthworms and other soil organisms help incorporate the organic component into the soil. Organic mulch is preferred because organic mulch improves aeration and water-holding capacity. Plant selection is the most important step in xeriscaping. Plants should be selected that are native, as they are most adapted to the climate and they help maintain a healthy ecosystem. Keeping in mind how much sun your selected site will receive and how much water the site holds will help identify appropriate plants. Information on appropriate native plants can be found through the additional websites of interests at the bottom of this initiative, or by contacting one of the two contacts listed below. Plants can be acquired from Spence Restoration Nursery. Spence Restoration Nursery only sells to wholesale accounts but periodically sells around Muncie, dates and times can be found on the Spence Restoration and Nursery FaceBook page. 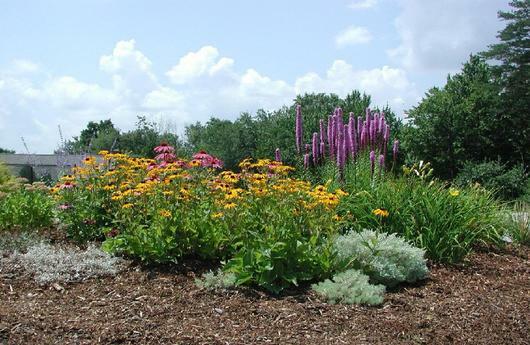 The Muncie Storm Water Department under the Muncie Sanitary District contracted the installation of native plants around City Hall that drastically reduced the need for irrigation, fertilizer, and pesticides. The plan includes over 75 different species of native plugs and hardy perennials, along with flowering shrubs, trees, and heat-reducing columnar maples. 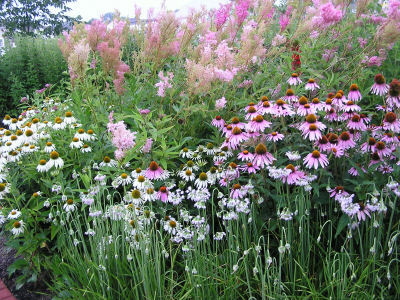 The mix of species including Iron Weed, Cup Plant, Black-Eyed Susan, and Coneflower were incorporated to attract both birds, butterflies, bees, and other insects, while Lavender, Sages, Liatris, Hardy Geraniums, and Day Lilies allow for a continual bloom from April through October. The use of grasses, Purple Love Grass, Dropseed, Indian grass, and Little Bluestem soften the landscape while providing additional food for song birds and structure for the landscape during the winter months. The focus of the landscape design was to decrease storm water runoff, lower maintenance costs, and increase the beauty around City Hall. Due to the horticultural maintenance of this landscape it has also become an educational tool for residents and visitors to visit and learn about native plants and their use in their own backyards and businesses. Detailed information on native plants in Indiana and plant characteristics. Detailed information on the benefits of native plants in Indiana and how to landscape with natives. A partnership program of the environmental Protection Agency which provides tips for designing water smart landscapes. Information about how xeriscaping started and additional information on xeriscaping. Keep in mind that the website provides some techniques specific to Colorado, which has a different climate than Indiana.